The Bahamian name for the island was Kay Comfort. Four reasons jump immediately to mind. 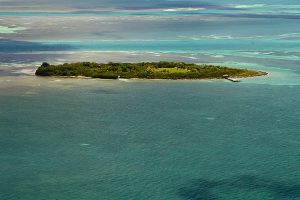 First, the island is located approximately midway along the Florida Reef—which begins to rise from the Atlantic floor near the Fort Lauderdale area and comes to an end some 70 miles southwest of Key West near the Dry Tortugas. Second, and due largely to the island’s offshore locale, historically it has maintained a reputation for remaining relatively mosquito free. Also, the island was once home to a naturally occurring deep harbor. Perhaps most importantly, nearby Lower Matecumbe Key was the site of five freshwater wells approximately four-feet deep and considered to be one of the most reliable freshwater sources in the whole of the island chain.